Our show is a “traditional” hour-long stand-up comedy show that is anything but traditional. 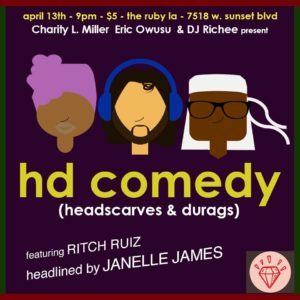 Headscarves and Durags (HD comedy) is a one hour comedy show featuring “woke” comedians with an emphasis on legitimate diversity. We book funny first, with hilarious socially conscious material by people of color, people with disabilities, people under the LGBTQI umbrella, and inter-sectional feminists. We’ve created an amusingly inclusive space, a community from the cross sections of society, and a series of sold out shows that are extraordinarily funny.